Mt Ruapehu, a constantly active volcano, is the highest mountain of the North Island and the destination of many skiers and snowboarders. Turoa and Whakapapa ski fields, both on each side of the mountain, have recently joined into one ski resort. Locals will tell you more about the eruption in 1995. 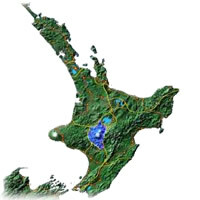 The region itself includes the Tongariro, Ngauruhoe and Ruapehu mountains. During the warmer months of summer, hiking, kayaking, canoeing and jet boating through the breathtaking scenery is all possible. One hour north of Palmerston North in magnificent hill country, only 10 kilometres from State Highway 1. On a 300 hectare farm (sheep, cattle, deer, a horse stud) with a river running through it and guided trout fishing available. Close to all river adventure activities - rafting, canoeing, kayaking, jet boating. Gourmet dinners available on reservation with fine New Zealand wine available. Your host & hostess speak French and German, and a little Italian, and have travelled widely. Based in Turangi, only 40minutes from Taupo, is a Grade 3+ Whitewater Rafting experience that combines the heart pumping action of more than 60 rapids with sufficient lower grade water that enables the splendid scenery and ample wildlife to be enjoyed. Our knowledgeable and professional guides provide fun facts throughout the trip and will challenge your limits by daring you to do our cliff jump. Join us at Square Edge in The Square on the first Sunday of every month for an afternoon of arts, crafts, food and music. Nau mai, haere mai! All welcome! Contact [email protected] if you'd like to have a stall and sell your own goods. A programme for the under-5s, focused on self-directed play and exploration. Nau mai, haere mai! – Open daily from 10am to 5pm. General admission is free – donations welcome. 0800-4-A-MUSEUM.